PuzzleMad: Even More Turning Madness! 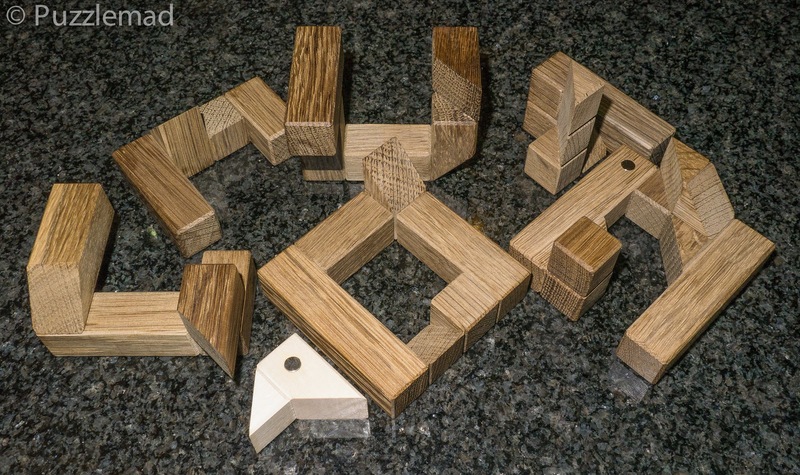 At the beginning of January I waxed lyrical about a wonderful design by Gregory Benedetti which had been made by Brian Menold, the Tronc Commun 4 was what I consider to be the very best "Turning Interlocking Cube" ever designed. When Brian announced a new update was imminent I had an inkling that there might be another in the series available. I spent a fair amount of time hitting the refresh button on my browser to load and reload his site. His service provider was having problems at the time and it took a while before anything was showing up. 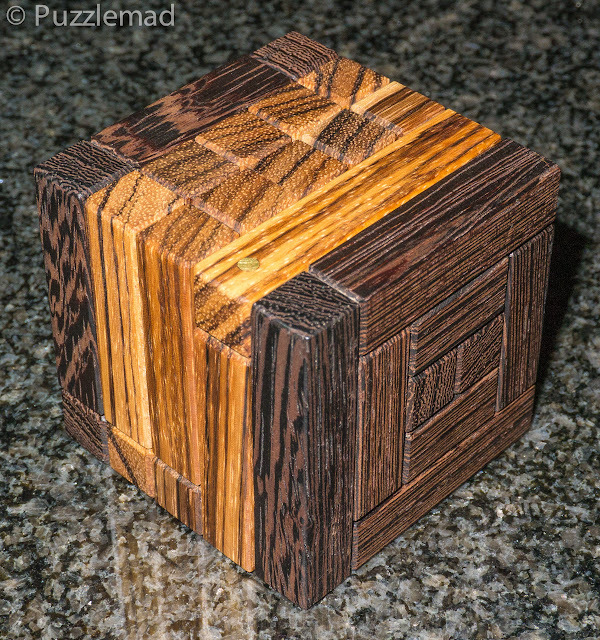 Luckily I got there pretty quickly and picked up a beautiful cube - Tronc Commun 3 made from Wenge and Zebrawood. My parcel then got held up by British customs and I was tortured by reports from my friend Ali who had also picked up a copy and thought it was fabulous. I had actually solved it in the past when Bernhard had made me a prototype version from Maple which was fun but functional. As is usual, I have forgotten absolutely everything about it apart from that I own it and that it was good and having gotten a copy of number 4 from Brian I really did have to get the number 3 in exotic woods as well - after all it is a collection and you cannot have too much wood! I finally got my package a week later and I took my customary photos before having a play. The first piece comes out nice and easily (Level 1) and then the adventure really begins. The next step requires another 5 moves and requires a rotation. There are a few possible moves to choose from but it is not too hard and just gives a hint that some really fun things are going to come later. 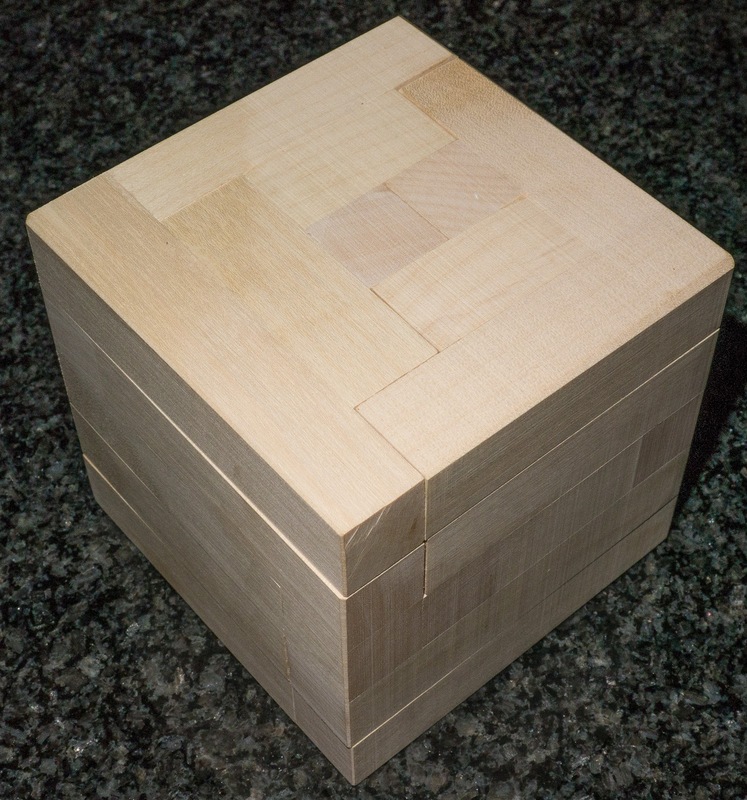 As is usual Brian had made the puzzle absolutely perfect and everything slides beautifully with no catching and just the right amount of friction. Once the second piece is out, there is a lot of movement in the puzzle and it gets frightening as everything seems to want to go in every direction. With a bit of discipline it is possible to isolate the possible movements and be systematic and there's a lovely Aha! moment when the progression to the third piece removal ends in a very unexpected sequence with even more rotations and 7 more moves. This leaves the 2 large main central pieces encircled by a ring and everything moves in all sorts of directions. The fourth piece comes out after a further 14 moves. 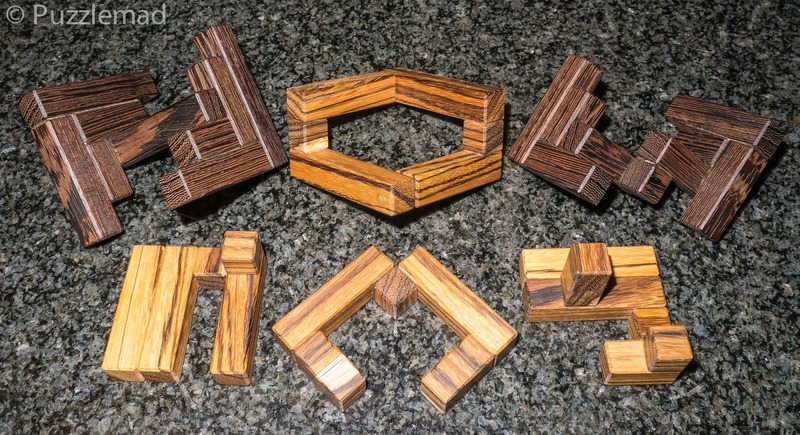 This feature of pieces requiring progressively more moves is very unique to the TICs; it is more common with other interlocking puzzles and burrs that after the first piece or two come out then it gets progressively easier. It was at this point that I got properly stuck. The encircling ring can rotate freely and the 2 main pieces can move all over the place. Finding a useful move that seems to progress towards the solution evaded me for a couple of days. I did find a very interesting move that spun the 2 main pieces around each other at a very odd angle and then I hit a wall! There was a LOT of swearing and sweating because I had gotten into a very entangled position and not only could I not get it back to the start, I had actually wedged them all solid and no moves were possible at all! I genuinely thought I had permanently jammed my new toy. I left it overnight and the following day tried again (that was NOT a good night's sleep). Luckily I somehow released the jam and after a whole evening of trying managed to get those three remaining pieces back to the start and breathed a sigh of relief. Time to think© - man, that really hurts my tiny brain! I had spent so long on this one going back and forth that I felt confident enough to scramble the pieces and try the assembly after a little wait. This confidence was entirely misplaced! As usual I was left with a puzzle I couldn't reassemble and more swearing in the evening and upsetting the "frightening one". It took me another day before I managed to reassemble the cube! Putting the easier pieces in was not the problem - it was redoing the main pieces and the ring that caused so much angst as there are just so many possible positions to start a movement sequence with. I did manage it in the end but it frightened me so much that I think I'll be a bit more circumspect with future puzzles. Is this one as good as Tronc Commun 4? Not quite, but it's not far off it. I am truly delighted that I have both in my collection in fine gorgeous wood and can recommend purchasing or making a copy if you get a chance. Brian has sold out of these but maybe he will make more in the future? William Hu is a tremendously talented designer with some truly amazing designs published. When Eric Fuller announced that he was going to produce the Slant cube I was delighted and couldn't wait for a chance to own another TIC. Unfortunately, due to the vagaries of international time zones and an early night for me after a particularly busy night on call the day before, the site went live whilst I was asleep and to my horror all 38 copies of Eric's version had sold out before I woke up - sob! I did see a copy at a subsequent MPP but did not manage to solve it there. I was hopeful that it might be made again. I was very surprised when William himself contacted me to say that someone else was making them and if I asked I could get a copy (No, I cannot let you know who it is - they have asked to remain anonymous). Within a few minutes, I sent off a quick email and got an affirmative response. A couple of weeks later I had this gorgeous thing made from Dark Oak and Maple. The first 3 pieces come out pretty simply - the puzzle has an initial level of 1.1.1 which in itself is very unusual. On top of that looking at the pieces that do come out reveals a hind for why the puzzle has the name - these are very strange shapes! After that I was a bit stuck. I had a vague recollection from the MPP that there were some very unusual rotations now and several pieces would turn or move together. I tried a few different things and almost dropped it on the cat again when a most unexpected move occurred - it was almost horrific with a huge rotation AND a coordinate movement at the same time! It was so unusual that I felt it could not be incorrect and lead to a blind end so I continued further along that path. More strange moves were possible and almost a logical progression occurred. The oddly shaped pieces locked together beautifully to allow others to come out. I managed to dismantle it in a single evening of wonderment! Just look at those odd shapes! Slanted cube pieces indeed! The reassembly is not too difficult if you have been paying attention to the initial disassembly. 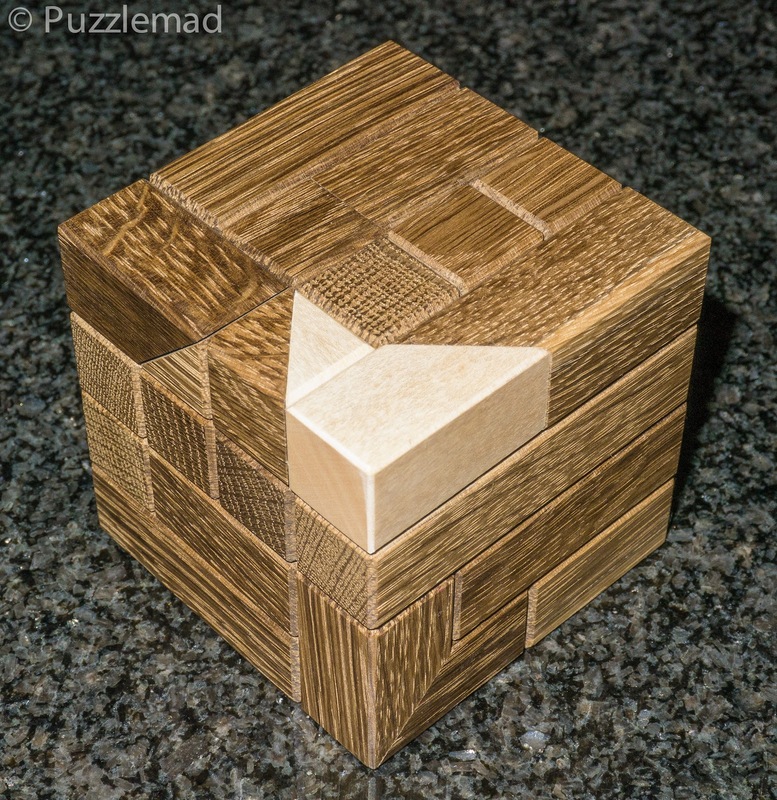 The puzzle is truly wondrous and those who get a copy should be very grateful to have one in their collection. I am sure there are many others that I have forgotten about. I absolutely adore this particular genre of puzzle and have to blame the brilliant Bernhard Schweitzer for leading me into this group! I cannot wait to find some more and work on them.